Moone Boy star David Rawle says that filming the true life story of a young man from Clare who killed three people in the 1990s was a heart-rending experience. In Property of The State, the Leitrim-born actor plays Clare man Brendan O'Donnell, who was convicted of shooting dead a mother, her toddler son and a local priest in 1994. The film, which also stars Elaine Cassidy, Aisling Loftus and Joe McGann, is in cinemas this November and tells the story from the point of view of O'Donnell's sister. Speaking on RTÉ Radio 1's Ray D'Arcy Show, Rawle said: "Obviously when I read the script I thought this is completely different from anything else I've done but what was interesting is that the story is told from his sister's point of view. "It wasn't the story of a terrible person. It was the story of a young boy, who I play, who is put down all the wrong roads and makes all the wrong decisions and ends up where he does. It's a very, very morbid story but it was something I wondered could I actually do. "I'm actually really glad I did it. I saw the film at the Galway Film Fleadh and it is beautiful and heart-rending." O'Donnell received multiple life sentences but barely a year in the custody of the Central Mental Hospital in Dublin, he was found dead. An Inquest found the cause of death to be an overdose of prescribed anti-psychotic drugs. 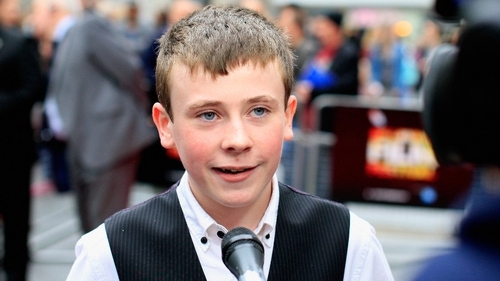 On a lighter note Rawle, who is now aged 15, hinted that a movie of hit rural comedy Moone Boy could be on the way. Rawle also recalled having to watch the decidedly adult Bridesmaids, which starred his Moone Boy co-star Chris O'Dowd as an LA cop, at the insistence of his aunts so he could research O'Dowd's work before working with him. "I remember an awkward 11-year-old me having to watch Bridesmaids," Rawle said. "My aunts and sisters were saying, `oh you have to see what Chris is like'. So I watched this 15 cert movie feeling very awkward."